The truck will serve both original items, as well as a few new ones. New dishes include the Pastrami Dog (a hot dog topped with pastrami, sauerkraut, Swiss cheese and mustard) and the Italian Dog, topped with red bell peppers, pepperoncini, onions, tomato, lettuce and Italian dressing. The truck is only one of several planned locations for the Pup. Most notably, the original facade will return when another location opens in downtown&apos;s L.A.&apos;s The Bloc in August of 2017. Tail O&apos; the Pup first opened in 1946 on La Cienega. At that time, the stand belonged to celebrity dance-team Veloz and Yolanda. They would sell the stand to Eddie Blake in the 70s, who ended up having to close and relocate the eatery to N. San Vicente Blvd. to make way for a hotel in 1986. In 2005, Blake was forced to close the stand for developments once more. The weenie languished in storage for several years before making a trip from Torrance to Las Vegas for restoration in 2014. Brett Doherty and Kevin Michaels of Killer Shrimp bought the franchise in 2015 after successfully outbidding Rick Caruso, who had wanted the Pup for The Grove, according to Curbed LA. Here&apos;s the stand making a cameo in a 1974 episode of police drama Adam 12. In this episode, the proprietor calls the cops to complain about people who aren&apos;t customers taking up all the parking. Some things never change. 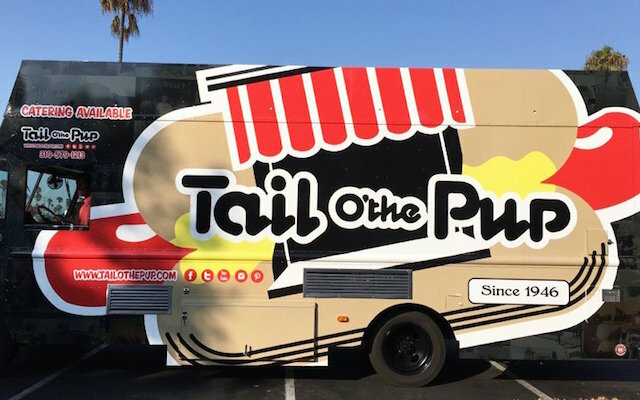 Tail o&apos; The Pup&apos;s food truck officially opens on Thursday, September 8 at 3 p.m. Find the Facebook event here.